> Amtex is hiring smart and energetic freshers with software testing knowledge for our testing team in Siruseri, Chennai. > Should be well versed with Testing fundamentals and concepts, MS SQL , database and UNIX commands. Certification in software testing is an added advantage. > Salary : INR 1.32 LPA during probation and salary will be increased post probation completion. Madhapur Village, Hyderabad – 500081. > Strong hands on experience in automation test scripts development. > Experience in design & development of test automation frameworks from scratch. > Should be able to prioritize, estimate & write the automation test cases. > Understand requirements and come up with comprehensive test case list. > Understand and follow all the standard procedures in QA team. > Understand technology and domain areas for the tasks assigned. > Familiarize with all testing tools employed and be ready to pick up new tools and technologies based on the project needs. > Strong in web services automation with tools like jmeter , REST-Assured. > Designing and writing test automation scripts. > Maintaining automation test runs using continuous integration tools like Jenkins. > Candidates who can join Immediately to 30 days will be preferred. Company Name : Atyati Technologies Pvt. Ltd. Collaborate with Project Managers and customer (if available) to define the user stories and form quality-driven conditions of satisfaction (acceptance criteria). Collaborate with developers in creating test-oriented code and implementing a whole-team approach when it comes to quality/testing, for example, teaching TDD and implementing pair-programming and pair-testing sessions. Create, execute and maintain the developer’s checklist, QA checklist, test strategy, test release plans and test cases documents. > Strong knowledge of Unified Functional Testing. > Design Automation Framework, Execute and maintain automated test scripts. > Good understanding of software testing processes. 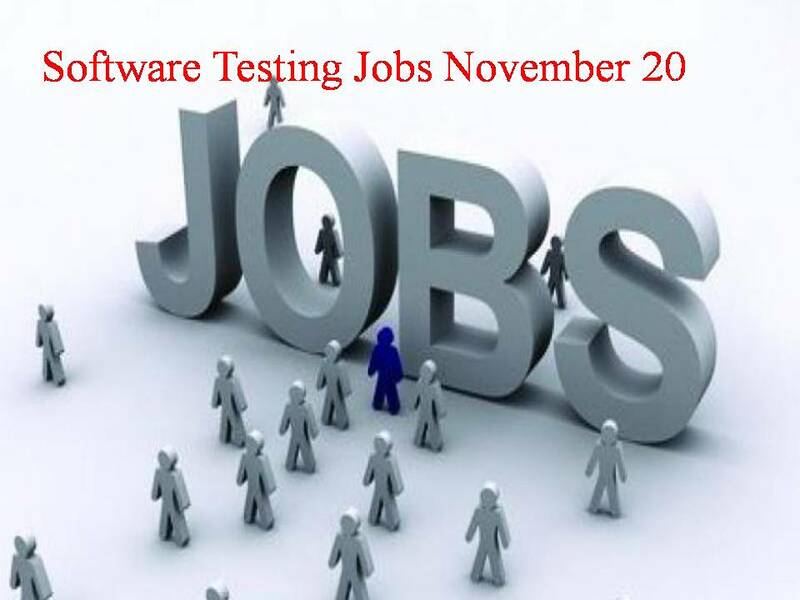 Company Name : Software Data India Ltd.
We have an urgent job opening of Software QA with a US based Software MNC. This position us available FT with our company Software Data(India) Ltd, a CMMI L3 compliant Software Services Group, part of Data Inc Corporation, Montvale, US. Test case preparation, Web Testing, Content Testing, Defect Tracking, Bug Reporting. > Understanding of server side technologies such as webapps etc. > Experience with Jenkins or other build servers like Travis CI, Gradle etc. 7 Years of relevant industry experience in software testing Good knowledge of software quality assurance and defining quality strategies for projects and client engagements Good knowledge of the company product development lifecycle and the process tools . Prepare Software QA Test Plan , estimate and review QA efforts . Proficient in at least one test automation tool used within the company . Good industry trends awareness Good knowledge of estimation techniques Good knowledge of release management Excellent knowledge of functional , system and performance testing Good communication skills . Good ability to anticipate issues and formulate remedial actions . Participate in peer reviews of documents . Experience in writing new test scripts and test cases . Lead end to end test activities using appropriate tools and techniques . So let’s connect further on this. > Strong understanding of testing methodologies and practices. > Excellent knowledge of SDLC, STLC and Defect management. > Experience in using any Bug tracking tool like Mantis BT, Bugzilla, etc. > Proficient in Manual Testing – Requirement Analysis, Test planning, preparing Test cases, review & execution. > Able to write test cases/scripts for automated testing of web based applications using Selenium Web driver.